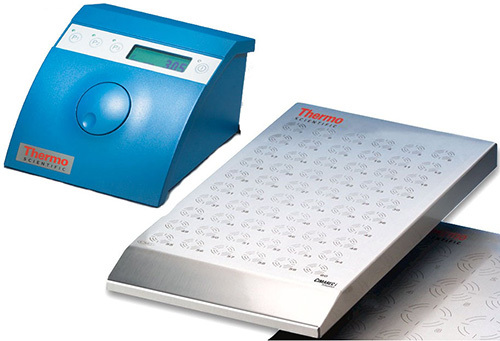 Thermo Scientific Cimarec magnetic stirrers are designed to provide unmatched reliability, safety and performance. Renowned for their outstanding quality and durability, Cimarec stirrers feature powerful magnetic couplings to ensure precise, reproducible stirring performance for both general and specialty applications. Cimarec stirrers offer safe, low voltage operation resulting in an environmentally friendly solution that decreases power consumption and lowers heat output. Part Number 50087876. Thermostats are equipped with a circulation pump and digital temperature display. Part Number 50087867. Thermostats are equipped with a circulation pump and digital temperature display. Part Number 50088016. Add an additional 9 feet between the controller and the stirrer with this extension cable. Part Number 50087924. Pack of 5 stir bars. Ø9 x 15 mm. Generate over three times the torque of conventional stirring bars with Thermo Scientific Komet Stir Bars, significantly enhancing stirrer performance and applications versatility. Superior mixing action at high speeds, and with viscous media. Evenly coated PTFE surface prevents residue deposits. Steam sterilizable to 121°C. Part Number 50087930. Pack of 5 stir bars. Ø13 x 30 mm. Generate over three times the torque of conventional stirring bars with Thermo Scientific Komet Stir Bars, significantly enhancing stirrer performance and applications versatility. Superior mixing action at high speeds, and with viscous media. Evenly coated PTFE surface prevents residue deposits. Steam sterilizable to 121°C. Part Number 50087909. Ø21 x 50 mm. Generate over three times the torque of conventional stirring bars with Thermo Scientific Komet Stir Bars, significantly enhancing stirrer performance and applications versatility. Superior mixing action at high speeds, and with viscous media. Evenly coated PTFE surface prevents residue deposits. Steam sterilizable to 121°C. Part Number 50087902. Ø25 x 90 mm. Generate over three times the torque of conventional stirring bars with Thermo Scientific Komet Stir Bars, significantly enhancing stirrer performance and applications versatility. Superior mixing action at high speeds, and with viscous media. Evenly coated PTFE surface prevents residue deposits. Steam sterilizable to 121°C. Part Number 50093334. Ø17 x 30 mm. Generate over three times the torque of conventional stirring bars with Thermo Scientific Komet Stir Bars, significantly enhancing stirrer performance and applications versatility. Superior mixing action at high speeds, and with viscous media. Evenly coated PTFE surface prevents residue deposits. Steam sterilizable to 121°C. Includes a wear-resistant glide ring for extended life. Part Number 50093335. Ø26 x 50 mm. Generate over three times the torque of conventional stirring bars with Thermo Scientific Komet Stir Bars, significantly enhancing stirrer performance and applications versatility. Superior mixing action at high speeds, and with viscous media. Evenly coated PTFE surface prevents residue deposits. Steam sterilizable to 121°C. Includes a wear-resistant glide ring for extended life. Part Number 50093336. Ø31 x 90 mm. Generate over three times the torque of conventional stirring bars with Thermo Scientific Komet Stir Bars, significantly enhancing stirrer performance and applications versatility. Superior mixing action at high speeds, and with viscous media. Evenly coated PTFE surface prevents residue deposits. Steam sterilizable to 121°C. Includes a wear-resistant glide ring for extended life.